If Tenerife is famous for anything, apart from being an exceptional tourist resort, it is for possessing the highest mountain in Spain and one of the highest in the European Union. The area which surrounds Teide is of volcanic origin and created a ‘lunar’ landscape which is both spectacular and beautiful. In this privileged spot there are many animal and plant species t that only exist in the Canary Islands such as the Teide Finch, the most beautiful bird to be seen here, or the Teide violet. It has been necessary to institutionalise these treasures of nature in order to preserve them, and thus the National Park of the revines of Teide was created. The meteorological Observatory and the International Astrophysics Observatory are to be found at one end of the valley. It is possible to be really close to the summit by the teleferico, like a ski-lift. The view at 3,555 metres (11663 feet) is a must-see: In a clear day, or even through the sea of clouds it is quite easy to spot most of the Canary Islands at simple sight. 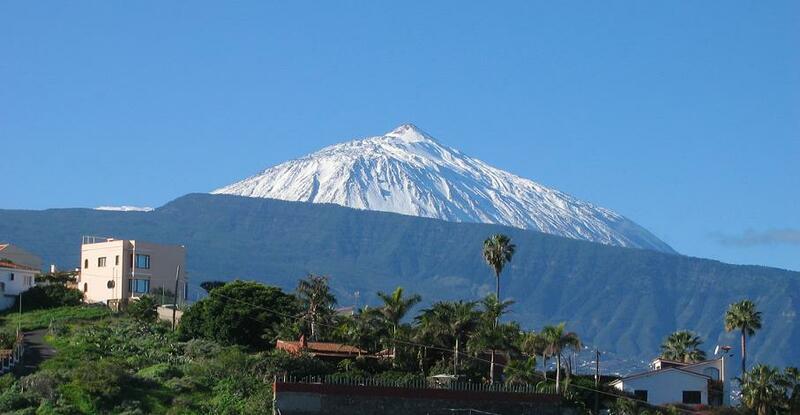 Today the Teide National Park has been inscribed on UNESCO’s World Heritage List (official page here). The north city of La Laguna is the other place in Tenerife already inscribed in the same list.